Flannel Friday! Forest Animal I SPY! I return to the Flannel Friday Fun this week with a flannelboard that I picked up from Storytime Magic: Forest Animal I SPY! While Storytime Magic does provide a template for you to use, I ended up using this one from Kidzclub. And, yes, I do know that Mr. Mouse has lost his foot. The trees I mostly did freehand. I haven’t had a chance to try this one out with the kids; however, I imagine I’ll go over the animals with them first (just in case they’re unfamiliar with some). Then we’ll play! …an animal who’s big, brown and furry and who loves honey (bear). …an animal who’s long and green and slithers on his stomach (snake). …an animal who’s white and who has long ears (rabbit). …an animal who’s brown and who has spots on its back (deer). …an animal who stays up at night and says ‘whoo’ (owl). …an animal who has a big, bush tail and who loves to eat nuts (squirrel). …an animal who has rings around its eyes and stripes on its tail (raccoon). …an animal who’s brown, tiny and very quiet (mouse). This week’s Flannel Friday roundup is being held over at Rain Makes Applesauce. And don’t forget to check out past great Flannel Fridays on Pinterest! Also, Melissa over at Mel’s Desk made some really awesome Flannel Friday buttons for our blogs! Thank you, Melissa! 🙂 If you haven’t already done so, skip on over to her blog and grab one (you’ll find it on the right hand side). 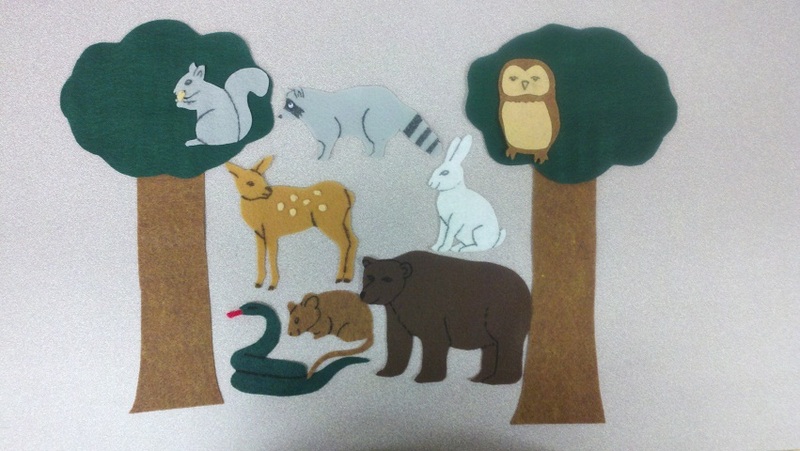 I JUST made a version of this myself for my woodland animals storytime next week. I think the kids are really going to like it! I think the kids will really enjoy it too. Unless I get a toddler-centric crowd. But I’ve got a back-up activity planned if that happens. Ooh, I’ll have to make this one for my upcoming missing/searching storytime. Missing/Searching is a great theme! I’m going to have to remember it for future storytimes! Love this! And you could do it for different habitats, too…like the ocean, with seaweed…or even work in Cate’s footprints somehow! (So no footprints for the ocean though.) I like that you can make it harder or easier, depending on how much of the animal is visible or tucked behind the trees. Thank you for doing Flannel Friday!